Several months ago, I scored an iphone through work and it’s become fairly essential to my day-to-day ever since. Though I would have been just as happy with an android equivalent and that would have been as useful. It’s achieved something of a long term goal for me, in terms of mobile computing. While it’s not without its frustrations I can now do just about everything on it that I could do on a laptop. Though it must be said that while some things are doable on a smartphone, they’re much easier on a full size computer. It wasn’t all that long ago that I was trying to live blog using a Psion 5mx connected via infrared to a nokia handset that was dialled in, as modem, to my ISP. I’ve even gone through two generations of netbooks: the original ASUS Eee 701, and a later ASUS Eee 901 – though I still use the latter for trips and notetaking in meetings. With a smartphone, I can do most things including take photos/video and upload them as well. The only tech in my shoulder satchel these days is my kindle. I’ve never quite felt comfortable having the phone in a bag, consequently it resides in my pocket. I was initially concerned that an iphone would be too big, but its slimness, compared to my old nokia handset, means it doesn’t seem as bulky. However, it has led to one notable absense: my fob. 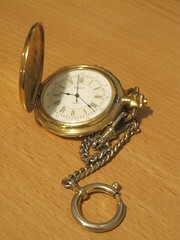 I adore my fob watch, and have had one fob or another for most of my life. Not the antique windup version; mine are bought new and have batteries. The phone sits in the pocket my fob used to and serves the same purpose; I’ve reverted to an old habit of checking the phone for the time, rather than the fob. Plus the fob and the phone used to click together uncomfortably – one or the other would have ended up damaged. So, I’ve stopped carrying my fob and I don’t quite know how to get round this. Certainly there are times when a dedicated watch is better eg on planes and when travelling. I still love the feel of a fob, and clicking a button to open the case to see the time. They go well with waistcoats, but I don’t know if I want to return to wearing waistcoats either – though I have several nice ones. A conundrum #firstworldproblems. Know the feeling well. You hel out a lot longer than I. Every now and then I take out the old fob to have a look.